While sitting in the bleachers at a high school football game, young Isaiah quickly grew bored. Nothing seemed to be happening and the game kept on dragging. Because he was with his aunt, the little boy felt that he could explore a bit more than he would if he was with his mother. 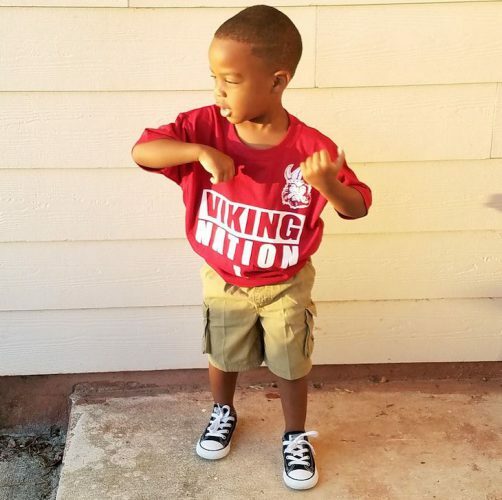 But he was growing tired and bored, and because his aunt was busy watching the football game, Isiah knew that she would not be able to comfort him right now. Isaiah is a young boy and isn’t afraid of what other people think. Because he was growing tired, he just crawled up into a stranger’s lap and fell asleep. It was an endearing moment, but when his aunt realized what had happened, she became furious. 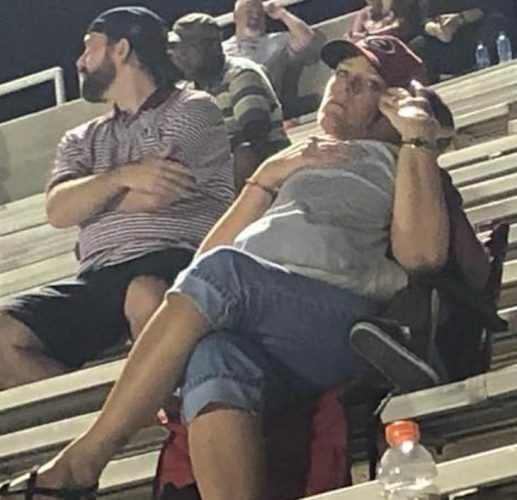 She didn’t want the boy embarrassing her – good thing the stranger found it utterly adorable and didn’t mind at all. 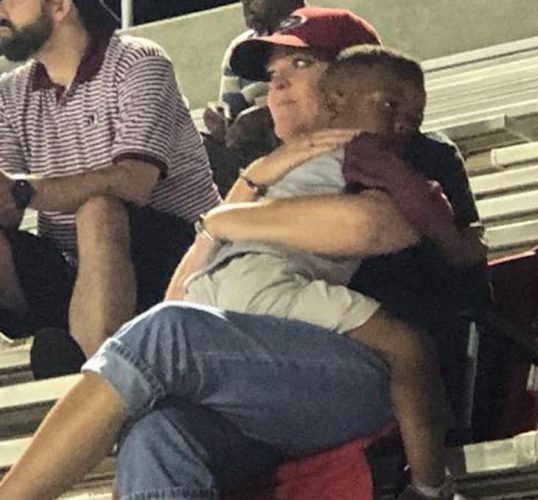 Since the heartwarming moment happened, Isaiah’s aunt Star shared the story on Facebook along with the now-viral photograph of Isaiah wrapped in the stranger’s arms. “However, she left right after halftime to meet up with her little girl. Fast forward to tonight… not long after we sat down at the game, Isaiah spotted her. She waved at him, and he made his way up to her. I thought their interaction would be the same as last time, but I was wrong. “Isaiah walked right up to her smiling, crawled in her lap and laid his head down on her shoulder. She welcomed him with open arms. This lady patted and rocked Isaiah to sleep like he had given birth to him. It was the sweetest! We asked her if she wanted us to get him, but she kept telling us she (and he) was fine! “Isaiah and this lady have NEVER met before other than those 20 mins at a game 2 weeks ago. I told her tonight that I am so sorry and I don’t know why he keeps bothering her. She replied he’s no bother and to not say that again. She said he was her new friend. She then went on to say she only has one child who is 15, and moments like this are priceless! “With all of the racial tension that’s going on, I’m glad to see the pictures like these because it goes to show color don’t matter to a lot of people. It really doesn’t! After Star’s post went viral, she learned the identity of the kind stranger. Awwww….such a sweet and awesome story. Never had this happen to me but I would love every moment of it. I believe that an awful lot of Americans are just like Angela. The younger generation of today just doesn’t take the time to look around. when i see things like this it makes me wonder why cant every body be like this little boy and that wonderful lady. the world would be a wonderful place to live in. Peace and Love, that’s what God intended for this world to be. that’s the love of JESUS! Isaiah could feel love from smile she came him & she felt love for him when he smiled at her! that’s JESUS working! Glory be to JESUS! Praise be to Almighty God! we have to let love of JESUS shine through us so others will know we’re willing to share love of JESUS with them without speaking a word! Praise be to JESUS! WE HAVE TO LET OUR LITTLE LIGHT SHINE!